Legnaia sul Garda is an independent house (60 sq meters) originally built in the 18th century, and recently restored by the owner. It is located just a few kilometers from the center of the historical town of Toscolano Maderno, one of the most popular holiday spots on Lake Garda. With its clear, clean and warm water, sunny beaches, mild climate and Mediterranean vegetation, Lake Garda is like a small sea set between the last spurs of the Alps and the Lombardy plain. Garda has been a favored spot since ancient Roman times (some Roman ruins still remain in the area) and has been lauded by poets and writers through the ages, including Catullus, Goethe, Joyce and D'Annunzio. Lake Garda is a marvelous combination of history, natural beauty and modern indulgences. Legnaia sul Garda consists of a living room/dining room with a table for four and a fireplace (decorative only). 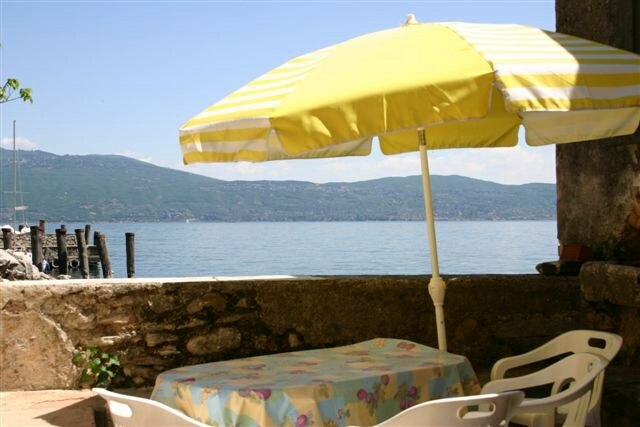 There is a large, sunny window with wide views of Lake Garda and the beach. On this floor there is a bathroom with a bathtub and a small, well-equipped kitchen with oven, toaster, refrigerator, microwave, dishwasher and washing machine. A television and screens for the windows are provided. A staircase (16 steps) leads to the lofted double bedroom (queen size bed). Please note that this room overlooks the living area, and therefore lacks privacy. Also on this level is a small bedroom with two single beds, best suitable for children due to its size. In the past this cozy house used to be the woodshed of the main palazzo, the Palazzo sul Garda. Please note that the two properties are totally separated; they have different entrances and their own outdoor areas. For a large group, these two accommodations when rented together work very nicely to accommodate up to 11 guests. From the narrow street, a wrought-iron gate opens onto a private courtyard. The entrance and the courtyard are shared with three other apartments located in the adjacent building. At the far end of the courtyard there is a view of the lake, but no lake access. In the front of Legnaia sul Garda there is a private area with table and chairs. Parking lots are available on the street plus one parking place available in the courtyard for the guests of Legnaia sul Garda. For stays of more than one week, an additional three hours of housekeeping and change of linens and towels is provided on Saturday. An extra bed is not available. Extra maid service is not available. There are many interesting and stunning little towns situated along the coast or in the hills such as Salò (8 km), Gardone Riviera (4 km), and beautiful Sirmione (37 km) - all of which are rich in history, culture, shopping, and good restaurants. From the house it is possible to walk to the village (500 m) where bars, Tabacchi shops, and the delicious Trattoria San Carlo are located. A larger shopping center with a pharmacy, grocery store, post office and bank is less than 1 km away. The nearest train station is in Desenzano del Garda (27 Km). Legnaia sul Garda benefits from a quiet location. The road leading to the house is used only by other people living in the area or people going to the Porticciolo - a little public harbor next to the house. During the summer season the harbor may be busy with people since it is a small, yet popular harbor. Pets are not permitted at Legnaia sul Garda. Air conditioning: Available for 10 Euros per day. Heat: Available in April and October (if needed) for 10 Euros per day; from November to March, charged according to consumption. From windsurfing to sailing, from golf to rock-climbing, from bungee jumping to trekking: on Lake Garda you can find facilities for almost any sort of sport and activity you can think of. Activities on the lake are perfect for people of all skill levels and guides/instructors can be contacted in town. Lake Garda boasts of un-crowded beaches, sports facilities of all types (including swimming pools and tennis courts) and clear and clean water. Other sports that are possible in the area include mountain biking, cycling, hiking excursions, rock-climbing, trekking, horseback riding, and pony-trekking. There are gorgeous golf courses within easy driving distance, as well as several amusement parks perfect for children.